Christmas is around the corner and coming up with unique gift ideas every year can be a hard task. Since nothing beats a handmade gift from the heart, today we will show you how to make a DIY Mini Memory Memory Album. This DIY is ideal for a Christmas gift, especially if combined with a set of Printiki Square Prints. It's not only a sentimental and meaningful gift but also the perfect way to display memorable moments of the year. Firstly, we will cut a piece of poster board 26,5 x 11 cm. We will mark the poster board with your hands, folding, on the following heights: 1 cm, 1 cm, 1 cm, 0,5 cm, 1 cm, 1 cm, 0,5 cm, 1 cm, 1 cm, 0,5 cm....and so on until you end as you started with 1 cm, 1 cm, 1 cm. See photo below. Fold the poster board on these heights. Tape the inside with a double-sided tape, so it stays tightly folded. Cut 10 poster board strips of 24 cm x 2 cm. Draw a 1,5-centimeter flange. With the flange inwards we stick it well and fold the strip in half. The next thing we will do is to fit these strips into the "accordion" we made before. Cut the cardboard in two pieces of 16,5 cm x 11 cm and one of 9 cm x 11 cm. Cut the fabric in one piece of 23 cm x 15 cm. Draw lines on the following heights: 7 cm, 8 cm, 17 cm, 18 cm. Later we will glue the cardboard onto the fabric and fold the part left to inside. Cut the scrap paper in two pieces of 15,5 cm x 14 cm. Should your scrap paper has any pattern, pay attention to its direction. Glue it to the outside of the cardboard, covering/overlapping around 2 cm of the fabric. Fold the scrap paper left to the inside and glue it to the cardboard. Cut two pieces of ribbon, around 15 cm each. Glue one piece on each side of the cardboard, in the middle. Cut two pieces of scrap paper of 16 cm x 10 cm and glue it with double-sided tape to finish covering the inside part. Fit the strips onto the accordion and fill them with your Printiki Square M prints. And voilà! 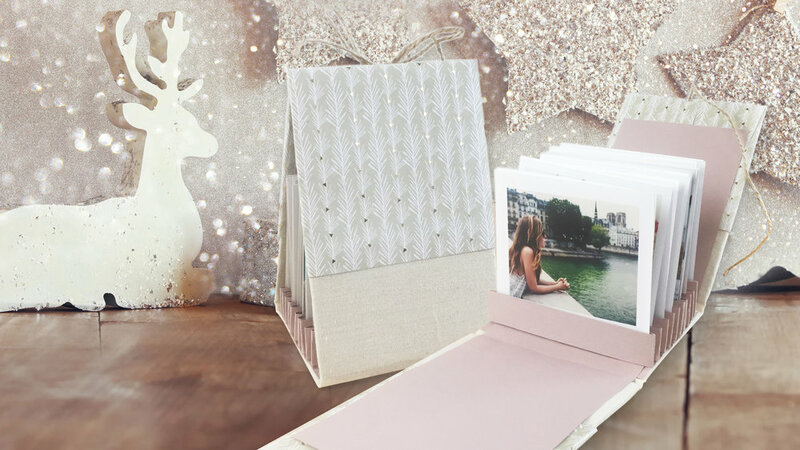 Your DIY Mini Memory Photo Album is ready to follow you wherever you go!